When the Rock Star and I started dating, he had a serious aversion to Brussels sprouts. I mean, making gagging sounds and the whole bit. Turns out his mom, like so many others, had ruined him for a myriad of vegetables by serving them as boiled to mush, flavorless nightmares. It wasn’t until I put them in front of him, seasoned and roasted, that he believed liking them wasn’t even a remote possibility. Now, not only does my entire family eat them, but they devour them, rarely leaving a left over. Recently, I was visiting a girlfriend and she served roasted Brussels sprouts. She included apple slices in her mix and the flavor was a solid win! 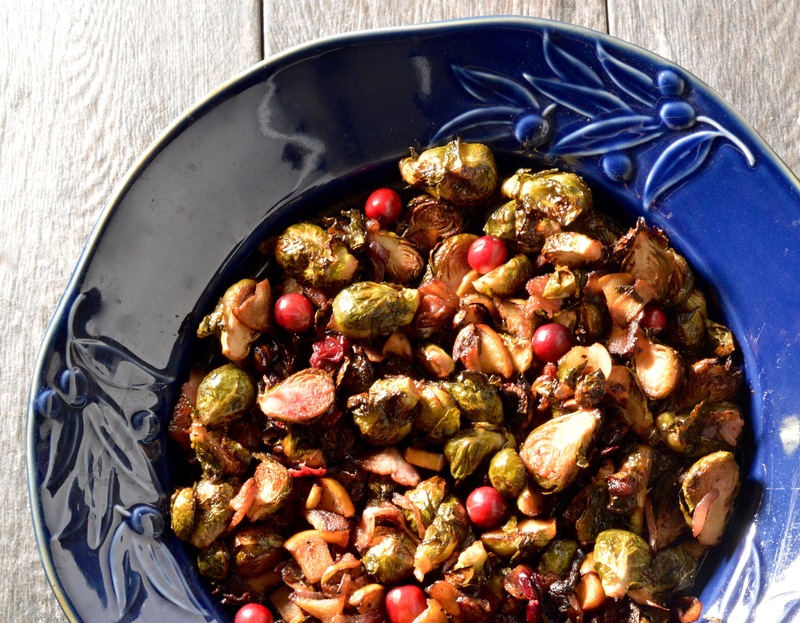 This is my adaptation of her roasted sprouts, fit for a holiday table! I’ve included, not only apples but also caramelized onions, bacon and fresh cranberries for a tangy zip that pulled the whole holiday thing together. 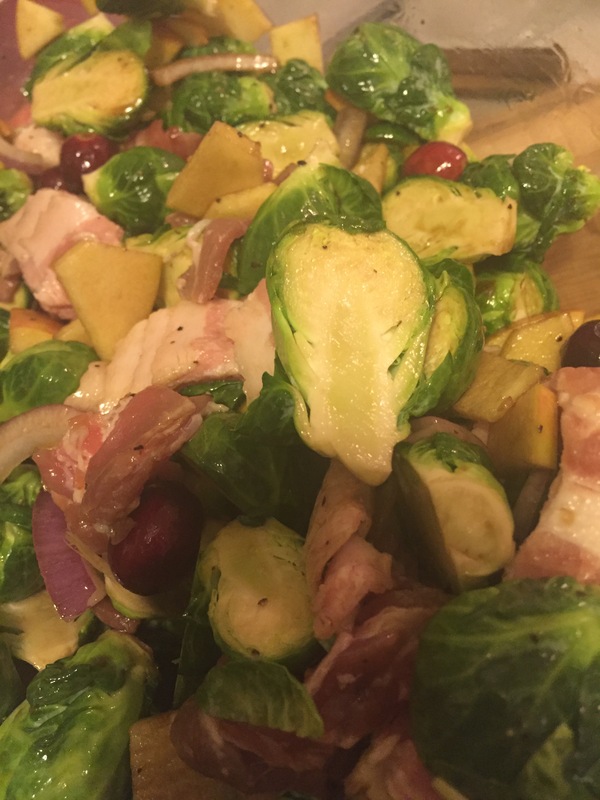 In a large mixing bowl, lightly drizzle sprouts, onions, apples and cranberries with olive oil and balsamic vinegar. S&P generously. Toss in the bacon pieces and spread all evenly on a baking sheet. Place in a 400 degree oven for 30-35 minutes or until crisp on the outside and tender on the inside. Toss them halfway through. The sprouts should be golden brown and crisp on their outer layer. In my house we like them bordering on black. The roasting really develops the rich flavors of this fantastic side dish. I hope you will enjoy them! Swearing Mom out. Here’s a picture of my adorable and precocious four year old, Lucius. 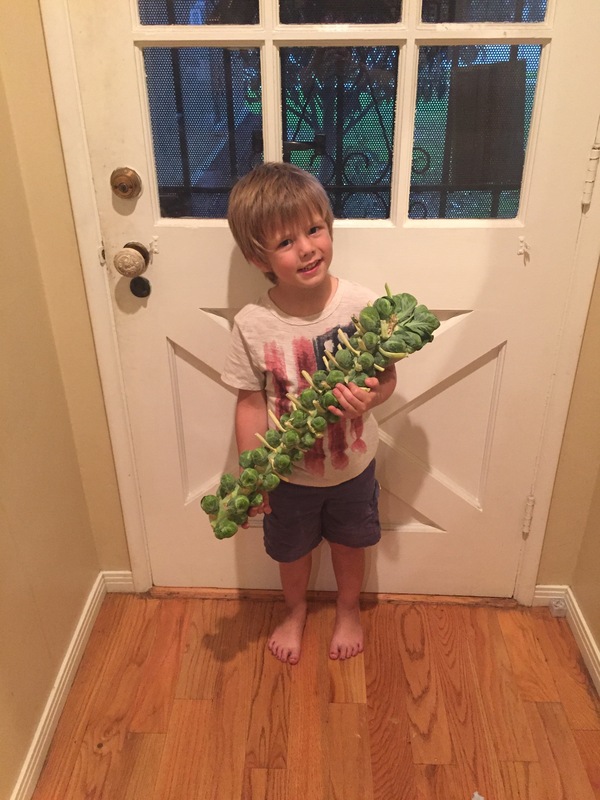 He’s holding the sprouts that we used for this recipe. It was great to see them on their stock in the market and to bring them home to show my kiddos how they are grown… you know, not in bags! Simple simple! Cut, toss, roast, enjoy!